Orchestrated with the help of 20 artists, the exhibition addresses a topic that applies to everyone these days: how to describe the forest to digital rabbits. The selected artists form a network, a rhizome, in which all parts differ substantially: they work using a variety of means of expression, are a variety of ages, and possess antithetical life experiences. Each of them is involved in the forest’s magical aspects, but does so in his or her own way. Almost all the works have been made specially for this exhibition. There exists a whole range of things that go far beyond a single person’s capability or comprehension. There are things that cannot fit into a person’s field of vision: one must back up very far to approach them. Or duck into a rabbit hole and create an extra dimension. Must throw three-dimensional space like a curve ball through the drifts of time. Must untie the mind’s knots. Must step past, outside, and beside oneself. Rhizomic resonance is an entirely suitable instrument for launching an extra dimension. The result is a multimodal exhibition that stimulates synesthesia. Peeter Laurits (1962) lives and creates in Estonia. He has enriched art’s means for photographic expression and broadened the role of the photo in Estonia’s cultural space. The geographic reach of Laurits’ creative activities is a broad one: London, New York, Chiang Mai. His works have been acquired by museums and private collectors in Estonia, Scandinavia, the United States, and elsewhere around the world. 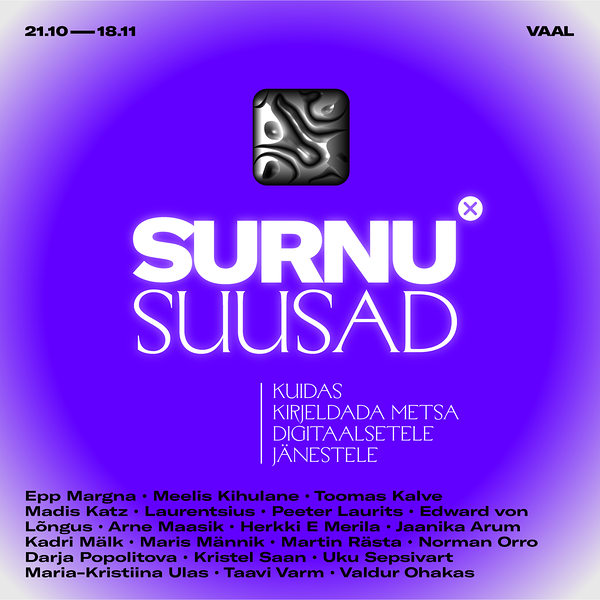 Laurits’ curatorial exhibition at Vaal Gallery coincides with his lecture series as a visiting professor of liberal arts at the University of Tartu, titled “Wild Aesthetics, i.e. How to Describe the Forest to Digital Rabbits”. The exhibition will be on display from October 21st to November 18th 2017.